The "O Autêntico" starts very close to the picturesque village of Querença, 12 km north of Loulé. The owners take great pride in their "Quinta", and we are equally proud to make it the starting point of this tour. Some people choose to stay here for two nights as it is such an ideal place to familiarize yourself with the rhythm of life in the inlands of the Algarve (beautifully located swimming pool and a splendid kitchen). The journey to Alte goes via Nave do Barão, Espargal and Benafim, small villages very typical for the south of Portugal. Alte is one of the most attractive and typically Portuguese villages. It is well-known for the quality of its spring water at "Fonte Grande" and "Fonte Pequeno". The Portuguese visit these springs from far away in order to replenish their own drinking water. The hotel in Alte is very comfortable and has very much retained its Portuguese atmosphere. 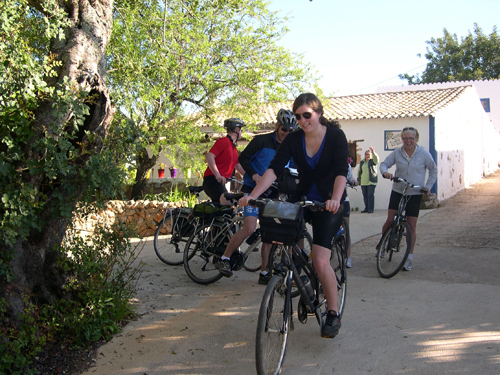 The tour now continues in the direction of Silves, a lovely old town situated on the river Arade. You will cycle on quiet back roads surrounded by orange trees and cork oaks and breathe in the most unpolluted air in Europe. On your way, you can take a refreshing dive in the "Barragem do Funcho" or the "Barragem do Arade". Of Phoenician origin, Silves was one of the most thriving centres of the Arab-Iberian world. Then called Xelb, it was inhabited by the Moors, who introduced their culture (scholars and poets), architecture and agricultural techniques to the Algarve. The Algarve has been and still is a melting pot of various cultures, not least of which were the Moors and reveals multiple influences in the architecture of its houses. The most striking craft is the making of decorative tiles known as azulejos, a technique the Portuguese learnt from the Moors. Two nights have been arranged in Silves, so there is plenty of time to savour the atmosphere of this town. A visit to the castle or the Islamic Museum are amongst your options and dinner at Café d´Inglès, next to the cathedral with its fantastic ambience, or fish restaurant "Marisqueira Rui" are very good choices. In Monte de Cima (beautiful surrounding in the foothills of the Monchique mountains) we use a delightful rustic accommodation offering five double rooms, all ensuite. You can relax around the pool, dine on the beautiful terrace sampling some of the delicious food the owner prepares, sip a glass of wine and watch the moon come up. As the final accommodation you have the choice between Lagos and Salema. Lagos is one of the Algarve´s most attractive and historic towns, with 16th century walls enclosing the old town´s pretty, cobbled streets and picturesque plazas and churches. We use a comfortable hotel in the centre of town. Salema is a charmingly small coastal village with an easygoing atmosphere. Here we use a small bed & breakfast, 1 minute from the beach and the ocean. The accommodations in Querença, Alte, Silves, Monte de Cima and Lagos all have private swimming pools. In Salema our bed & breakfast is located 150m from the ocean and the beach. The cycling is of moderate/intermediate level. The landscape varies a lot. The roundtrip Silves brings you to the south-coast, the roundtrip Monte de Cima to the Alvor estuary (also on the south-coast). Some climbing is involved on this holiday although none of the routes take you above 250 meters.